I am liking all kinds of dried branches this month. 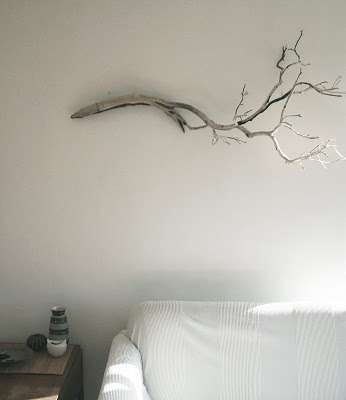 What a great way to incorporate all those branches one can easily pick while walking around the park inside our homes ! Tie them around a tumbler and you have the prettiest vase for your home. What do you think of this? Would you like something in your bedroom like this? I have to admit though I like it here...I think it would be a little spooky for me!! gorgeous.. I like this idea..
Super! I like the branch above the sofa idea, interesting! Loved the first one...and I think i'm going to try it myself. u seem to dig out the most brilliant of images for your posts...white walls are a major draw for me and love the dried twigs vase idea..yum! 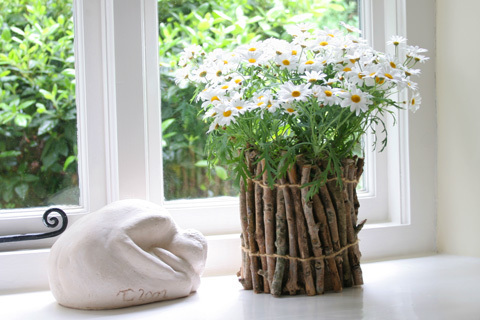 Thanks for posting the twig flower pot! :) I'm working on another twig project, it will be up hopefully next week! !